Disability benefits provide an essential safety net for many people of working age whose health prevents them from engaging in paid work. But many countries are increasingly concerned about the fiscal sustainability of high and growing disability insurance (DI) dependency rates. 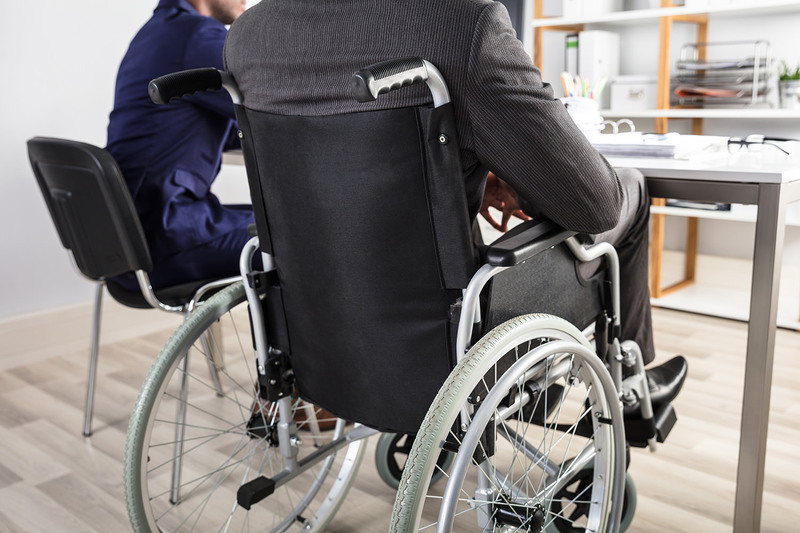 One of the reasons is that disability benefits may themselves contribute to low participation and employment rates among people with disability. There is also a perception that few people flow off disability benefits until either death or state pension age is reached. An important question in this context that policymakers and academics have been trying to answer for decades is whether DI dependency is transmitted from a parent to their children. 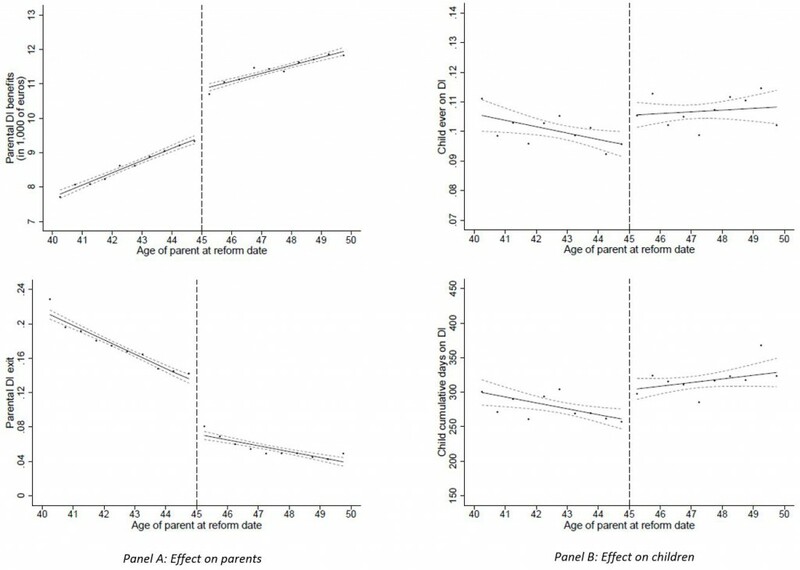 A simple inspection of the raw data displays a clear pattern that children whose parents were benefit recipients are also more likely to receive a benefit later in life. However, it is not clear whether these children become benefit recipients because their parents were, or because children and parents simply share some characteristics that make them more likely to claim a DI benefit. If the former is true, parental participation in social assistance programs could severely impact a child’s future economic situation and opportunities. In a new IZA Discussion Paper, Gordon B. Dahl (University of California San Diego & IZA) and Anne C. Gielen (Erasmus University Rotterdam & IZA) investigate this by studying a reform in Dutch DI that dates back to the mid-1990s. Following this reform all DI recipients under the age of 45 were re-assessed under stricter eligibility criteria, leading to lower DI benefits and to increased exit from DI (see Figure 1, Panel A). For those aged 45 and above, a re-examination took place but according to the old – and more generous – criteria. This sharp differential treatment in re-examinations can be exploited to learn how the reform affected the children of these individuals. The findings show that more than 20 years after the reform, reduced parental DI dependency led to a lower DI dependency among children. Both the probability that a child is on DI as well as the benefits received from DI are substantially lower for those children whose parent’s DI use was reduced due to the reform (see Figure 1, Panel B). In addition, there are positive effects on future labor market outcomes for these children, with a higher employment rate and a higher level of labor market earnings. Consistent with an anticipated future with less reliance on DI, children of parents exposed to the reform invest in additional schooling while young. All in all, these results illustrate a strong link going from parental social assistance participation to a child’s dependence on social assistance benefits. These intergenerational effects have important implications for fiscal policy. Ignoring any parent-to-child spillover effects understates the long-run cost savings of the Dutch DI reform by as much as 40% in the long run. Hence, when developing social policies it would be a mistake for governments to only consider current participants in a program, without accounting for the long-run effects within families. See also an earlier IZA Newsroom article on family welfare cultures in Norway. Disability onset increases receipt of disability insurance, a wider measure of sickness and disability benefits, and receipt of non-sickness benefits by six, eight and six percentage points, respectively, in the first year. Disability exit has an almost symmetrical impact on receipt of disability insurance and on wider sickness benefits in the first year, contrary to the perception of disability benefits being an absorbing state. Using the Dutch DI reform that affected recipients aged 30-44, the paper finds that reassessment of entitlement under more stringent rules reduced benefits by around 20 percent, on average, and reduced dependency on the program by 14.4 percentage points. These cuts produced a 6.7 percentage points increase in employment and a 8.5 point increase in the probability of working and not claiming DI. Unlike in most other countries, in Finland employers’ disability insurance premiums are partially experience rated. The paper shows that experience rating has reduced the disability inflow among men under age 50. For other groups the authors find no significant effects.